Ansonia Clock Co., "Columbia", ca 1904. 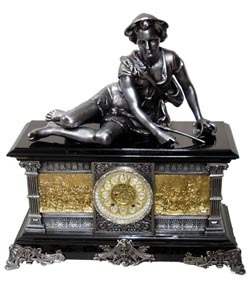 No doubt this was Ansonias top of the line for clocks of this type. It sold for $110 in 1904, which intodays dollars would be over $5, 000. This was a near perfect clock when Iobtained it from the Millers. Bruce Baziluk refinished certain parts of thesilver and gold to put it back to like new condition. It is as nice as anyyou will ever see. There are two frieze scenes on the front and one on eachside, all finished in gold, the rest of the case finished in silver. ShepherdBoy statue also finished in silver. The dial and sash are both silver andgold. The sash and numerals are silver, while everything else, inner dial, open escape, dial overlay, and hands, are all gold. The movement is 8 day, striking a gong on half hours and hours, runs fine. As clean inside as itis outside. The black part of the case is enameled iron and it is also nearperfect. It is 25" high and 24.5" wide. If you have never seen this clock, you would be surprised at the size, and the detail of the Shepherd Boy andthe frieze scenes. Ly-Ansonia No. 1581.